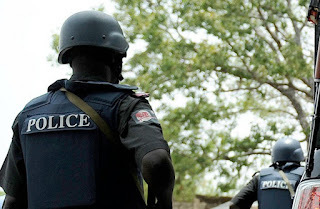 Four members of a highway robbery gang at Odogbolu junction along Sagamu–Ijebu-Ode Epressway have been arrested by the Ogun State Police command. The suspects identified as Israel Adams, Opeyemi Okegbenro, Ali Chibike, and Patrick Nwandagba were arrested at about 11:30 pm on Thursday. Confirming the incident, the state Police Public Relations Officer, Abimbola Oyeyemi, said the arrest of the suspects followed a distress call by members of the public that the hoodlums had blocked the highway and were dispossessing people of their belongings. Oyeyemi stated that before their arrest, police report indicated that the robbers had succeeded in snatching a Lexus RX 330 sport utility vehicle with registration number KSF 509 CV from one their victims. The PPRO said at the end of the encounter, four members of the gang were arrested while others escaped into nearby bush. He also pointed that the same gang had earlier on the same day attacked and shot one policeman, Oluwatobi Iwata, attached to Mobile Police 17 in Ondo State and one Samuel Olatunji, who later died on his way to the hospital. The spokesman assured that efforts were ongoing to apprehend the fleeing members of the gang.